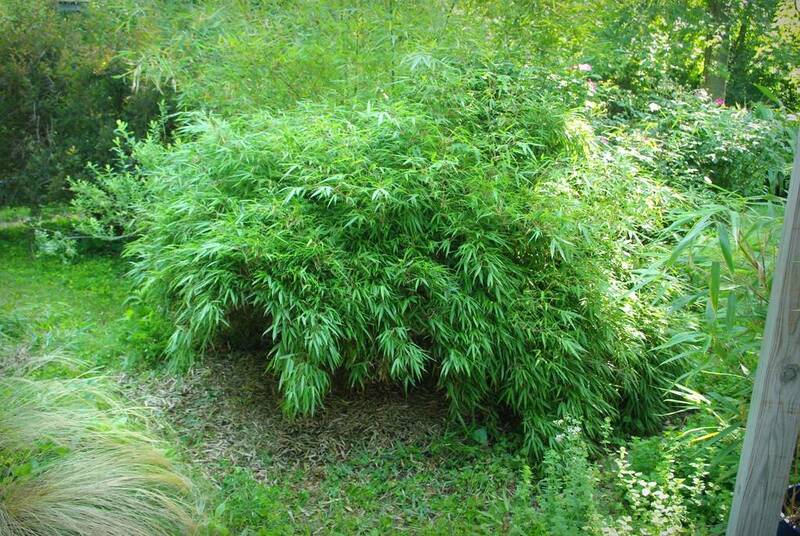 This was the first bamboo I bought and planted back in 2006, and its clumping habit has made it virtually care-free. 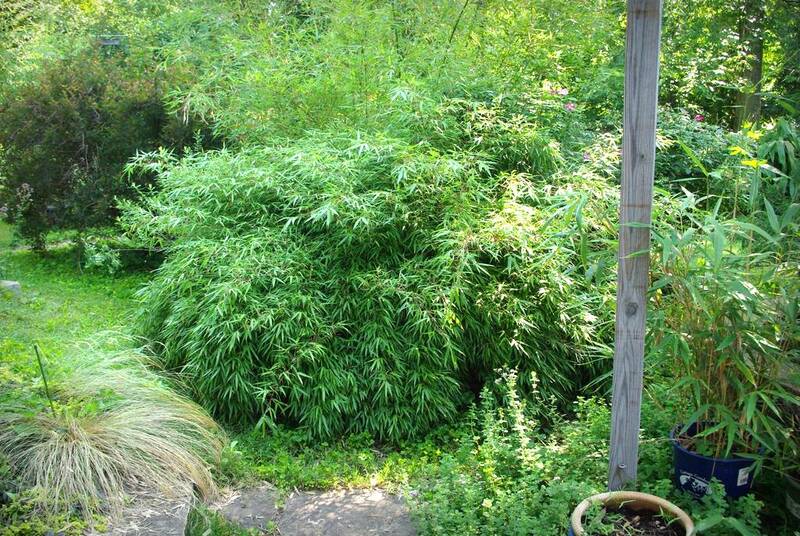 It will never get more than 8-10' tall though which is huge for this space, but not typically what you think of when you think "bamboo" -- this is more of a shrub than a "tree" type of bamboo. I decided to simply prune the ends of many of these culms to remove lots of the leaf mass that is making them droop to the ground. I removed very few entire culms, as I wanted their support to help keep the rest of the plant upright -- if I had thinned by removing lots of culms it seems like I'd just have a less dense but just as floppy plant. Plus there are spiders under there, and although I don't mind spiders in general it's the ones that hide in dark, secluded places that you have to look out for (like black widows and brown recluses). There was nothing tricky about this at all -- I just used my judgement to remove what seemed appropriate, mainly focusing on the bottom edge but also pruning some of the new culms higher up that were not yet fully leafed out but were now too long (and would soon start drooping). 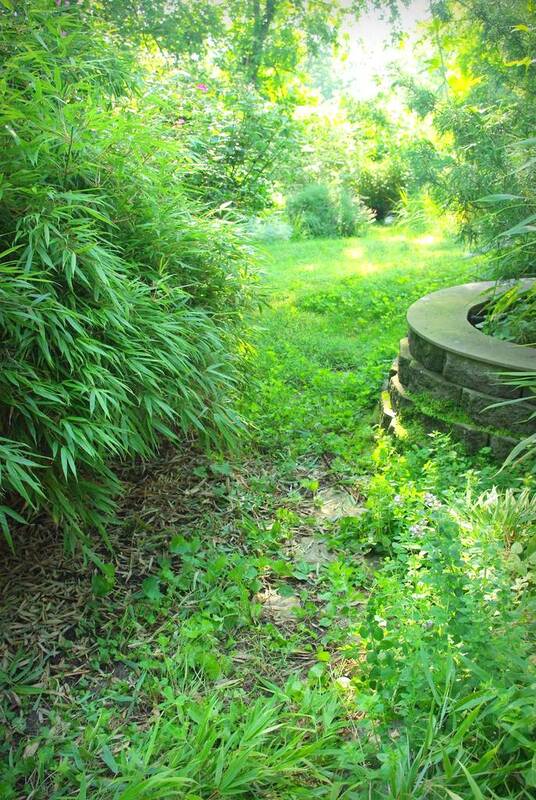 Hey, there are weeds growing under there! Imagine that! I can walk past it now! This is such a beautiful plant, and it really looks nice in this spot next to the patio. 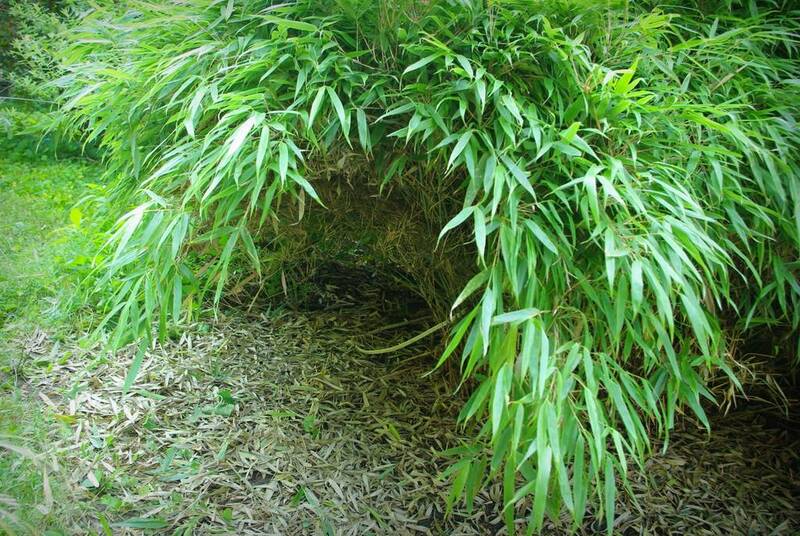 I doubt that it will ever be able to reach its full size here though, unless I want this end of the patio closed off by a wall of feathery bamboo leaves. So I'll keep taking divisions off this plant and pruning it. Some day I may have to dig it out entirely and replace with a fresh, small division and revert this plant's "clock" back several years, but that's a worry for the future. 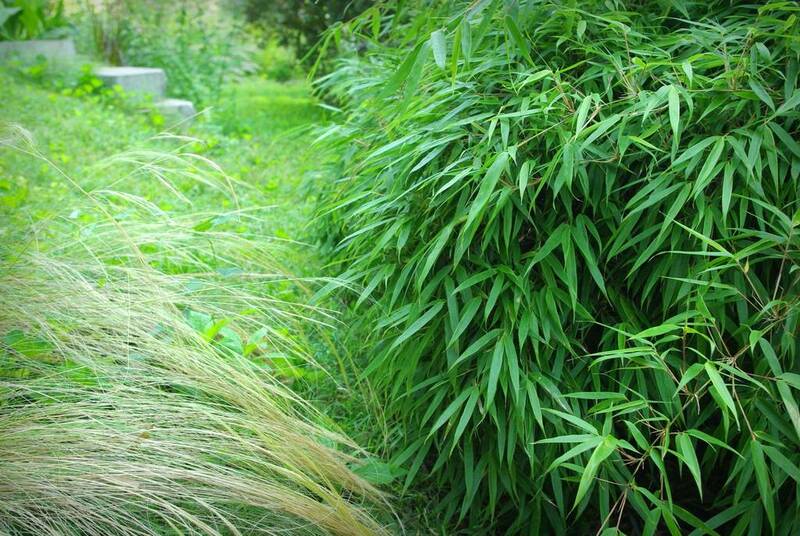 Note: I used to try and tie the culms of this plant up, but it didn't work very well and no longer seems that necessary. Yes, this plant gets flattened out when really wet, or snowy. But the pruning seems to have helped with overall droopiness, and the new culms are getting thicker and stronger each year. I hate having to support plants! I love pruning. I always feel like the plant is saying "ahhhhh! That feels so much better!" 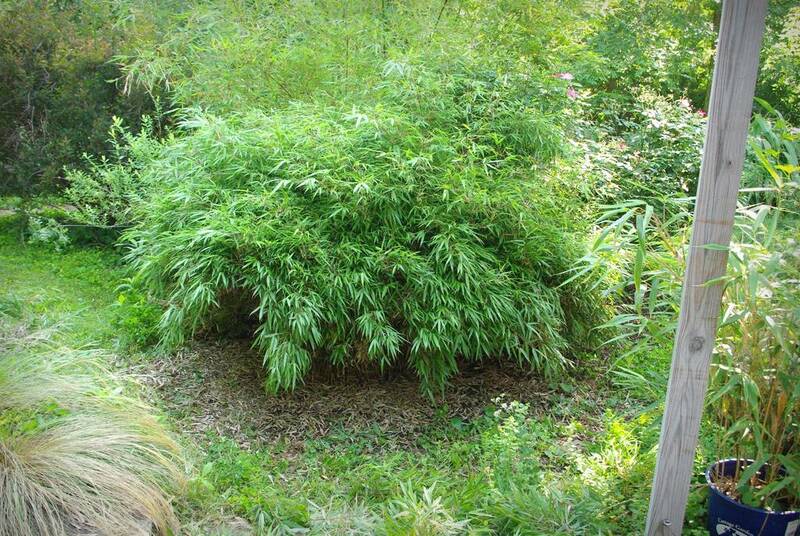 The folks at the Bamboo Garden where we live suggested exactly your technique if our Fargesia robusta gets droopier than we want. Apparently the shortened outside culms will help support the inside culms. Yours looks lovely and lush! 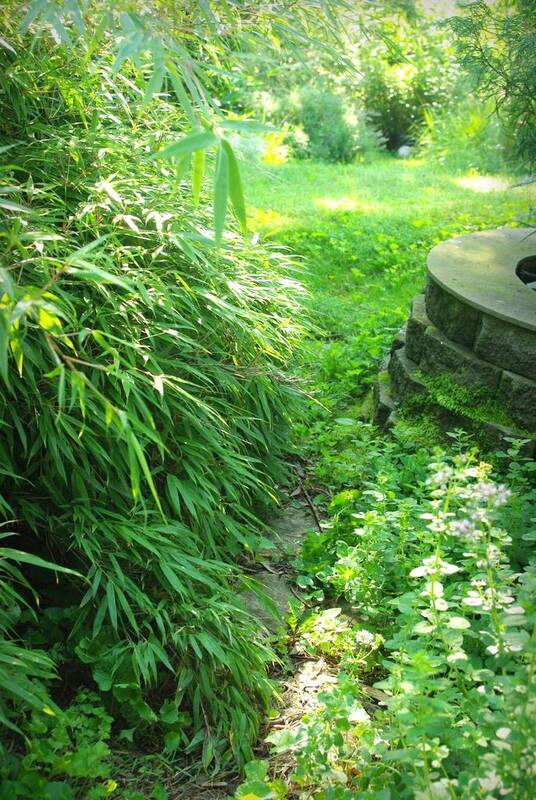 MulchMaid: you live at a Bamboo Garden? Nice! ;) Glad to hear I'm doing something right! Um... No thanks! I prefer clipping to digging!